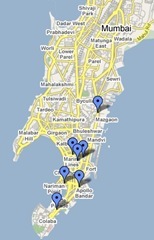 Terrorist attacks in Mumbai have taken place in the past also. But the terrorist attack in Mumbai during the night on November 26 is something different. About 101 people were killed and around 900 injured during the terrorist attack and follow up actions in 10 sites in Mumbai. It is reported that the terrorists have reached Mumbai through sea route. Eye-witnesses have said that they had seen young men in their early twenties carrying heavy rucksacks coming from high speed boats off the Gateway of India. Maharashtra Chief Minister Vilasrao Deshmukh has also stated that the terrorists got ashore in South Mumbai from boats. Indian Navy, Coast Guard ships and two marine surveillance aircrafts and choppers were pressed into service off Mumbai coast to look for ‘Mother Ship’ which could have ferried the terrorists who carried out attacks. The Indian Navy says that they have boarded a cargo vessel MV Alpha suspected to have involved in bringing the terrorists to Indian shores. Further reports are expected. Read more from The Times of India here and here. A high-ranking Russian secret service source has said that the terrorist groups who attacked the Indian city of Mumbai are closely linked to al-Qaeda. Read more from RIA Novosti. Further, Vice Admiral Sunil K Damle, Flag Officer Commanding-in-Chief, Southern Naval Command, has said that he would not rule out the role of Somali pirates either directly or indirectly in the terror strikes in Mumbai in view of the recent action by the Navy against the sea bandits in the Gulf of Aden. Read more from The Times of India. Here is an amazing photo essay covering Mumbai terror attacks from Time. Two suspected vessels MV Alpha and MV Al Kabir of Pakistan involved in landing terrorists in Mumbai, were apprehended off the coast of Gujarat in a joint operation carried out by the Navy, Coast Guard and the water wing of the Border Security Force (BSF). Read more from Express India. In the wake of recent terrorist attacks in Mumbai, the Union Minister of Shipping, Road Transport and Highways Thiru T.R. Baalu has asked the Directorate General of Shipping to undertake a special audit of port security in all the major Ports of the country to ensure compliance of all security measures. Read more from Press Information Bureau. Owner of Liveras Yachts, Andreas Liveras was one of those shot dead in the Taj Hotel terrorist attack. Read more from Sail World. Here is a video clip of Vice Admiral Sunil Damle’s media address. View another photo essay covering Mumbai terror attacks from Time. The satellite phone and global positioning system (GPS) map recovered from a trawler ‘Kuber’ abandoned in the high seas off Mumbai give some clue that the terrorists may have come through sea to Mumbai. Read more from The Times of India. 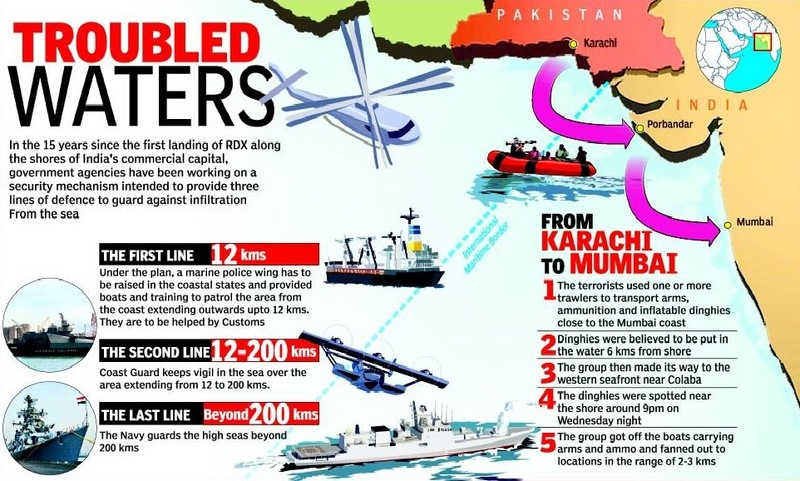 Here is an interesting graphics from The Times of India about the sea route used by terrorists to reach Mumbai. Also eye witnesses are available to confirm that terrorists arrived by boat to Sasson Dock in Mumbai. The terrorists killed the captain of the trawler also, who brought them closer to Mumbai shore. Further, the terrorists were even ready to go back through sea route on completion of their mission. Read more from Sify News, Hindustan Times and The Times of India.